Tell me what you want to achieve and I'll tailor specific skill sessions to improve your ski technique and accelerate your progression. I work at a pace to suit you, your family or your small group of friends. Whether you are a ski novice or an experienced skier looking to refine your technique, I create lessons that are just right for you. With a skills-based system of learning, I give you the tools to safely negotiate any demands the mountains make on you, helping you to increase your comfort zone and ski in a wider range of conditions. You will find my approach patient, flexible, safe, considerate and above all superb fun. Let me guide you around the slopes of Meribel, Courchevel and Les Trois Vallees - the largest ski area in the world, complete with 600km of pistes. With an extensive knowledge of the ski area and how the valleys connect, I’ll take you around the best pistes to suit your skill level. I keep you on the move to help you make the most of your precious time on the mountain. I incorporate as little or as much technical ski instruction as you wish, helping you to acquire new skills and put the techniques into practice while on the move. It’s a pleasure for me to share my knowledge of the Three Valleys with you and to let you in on a few of the mountains’ secrets too with suggestions for the finest hot chocolate and lunch spots. 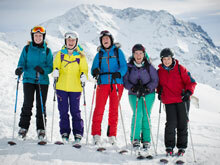 MH2ski ski lessons and guiding are 100% tailored to you. I help you acquire the skills that you need to take your skiing to the next level. I arrange a convenient meeting point with you prior to your arrival in Méribel. To enquire about MH2ski private ski instruction availability, please contact me with your dates and contact details. I look forward to skiing with you.